Screened at the 2013 New York Film Festival, Hayao’s first feature length directorial release since “Ponyo” in 2008 starts off as a striking peon to animated steam punk fantasy but ends up as an interminable repeating link of soap opera slush. The opening scenes of incredible flying machines, heroic actions of the most colorful and inspirational kind and dashing characterizations of pre-war inventiveness set the audience up for the film that is going to eclipse “Spirited Away.” The viewer is reader for the utmost in visually mesmerizing creativity to flow across the screen like the striking earthquake and dazzling raindrops of Miyazaki’s magic pen. Unfortunately, the film turns out to be a love story rather than a story of bold invention and unlikely success. Not that there is anything wrong with a good love story, but this is one of the slowest love stories on record, taking up what seems like the entire last half of the movie. The music that accompanies this is not only the most treacly pap imaginable, but it seems as if the exact same melodies are simply being repeated over and over. The tortuous lack of change in the music is matched by the unchanging plot, the unchanging scenery and the unchanging vision of the female lead of the film. The movie starts in grand fashion with Jiro Horikoshi (Zach Callison as young Jiro, then Hideaki Anno) climbing onto the roof and starting the engine of his wonderful flying machine. This is, after all, the animated and highly interpreted story of the inventor of the legendary Japanese Zero fighter plane of WWII. Jiro’s plane does the Zero one better, however, as its wings actually flap. 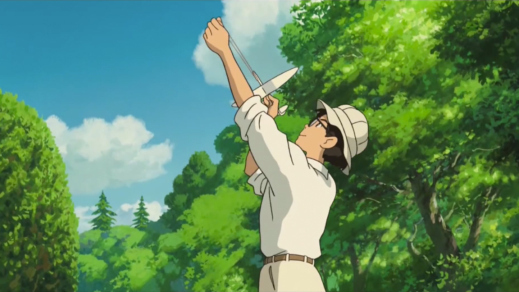 Creating a power of its own, even beyond that of its improbable engine, Jiro’s plane uses the power of birds in flight. In fact, it may even harness the power of birds in flight as it makes its way effortlessly though the air. Above, vague dots and dashes in the air form themselves into bombs and artillery shells of improbable but potent shape and form. As the behemoth emerges from the clouds, the missiles of death turn out to be leashed to the mother ship like the poison tentacles of a deadly anemone. The battle is joined and Jiro tumbles to his next battle, a horrific earthquake shown with beautiful and terrifying skill by Miyazaki. This also the place of the first meeting with Jiro’s love of his life and his wife to be. 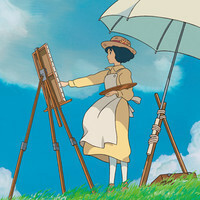 For the middle portion of the film, Miyazaki depicts Jiro wrestling to live his life of love with his soul mate and create what will be one of Japan’s ultimate weapons of destruction. This is a valid and accurate depiction of the allegory of life and death against the backdrop of peace and war. The country is at war, or soon will be, and Japan needs every weapon it can build. As many of the scenes are constructed as dreamscapes, so is the rest of the world asleep while Japan and Germany build up their military might. As the audience falls into withdrawal pains from the lack of visual stimulation of the marvelous steam punk, half-human-half-machine marvels we saw in the opening minutes, the film withdraws more and more into the repeated visage of Jiro’s dying lover. Much frowning on the part of a great cast of intrepid, if terminally depressed military innovators. It seems as though they knew the war was lost even as Japan’s innovators fight against the old ways. Maybe this film is not so much about the invention of a great new Japan as it is about the death of the old Japan and the new life that awaits it, even today. ← Review: Is the Man Who is Tall Happy? Sounds disappointing, but I’m likely to check it out.